Sometimes I need to take a break from writing about the pictures (as in films) by going out and taking pictures (as in very amateur photography). On a recent drive out to Doylestown, I stopped at Fonthill Castle for some photo ops. 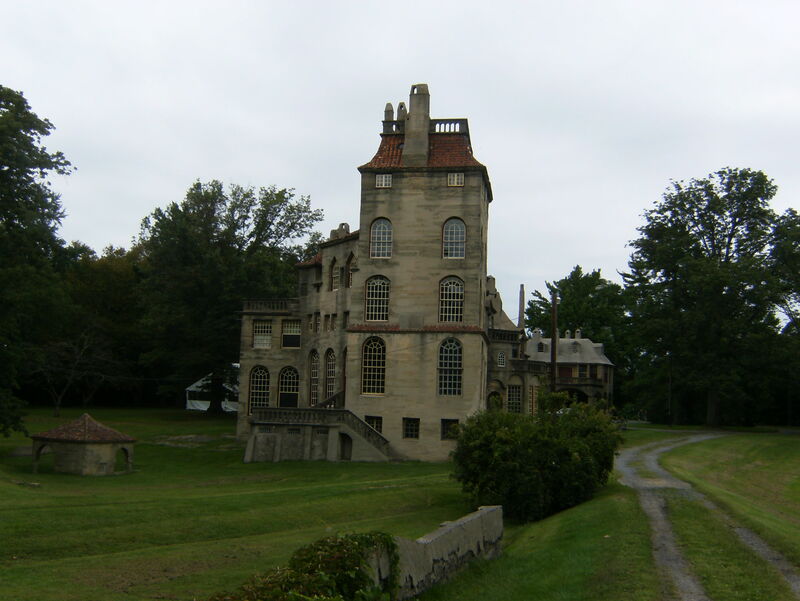 Click here to learn more about Fonthill Castle and the neighboring Mercer Museum. There’s really no better way to spend a day off from work midweek than taking a long drive. It’s especially nice on a beautiful pre-Fall day, and if it’s the first day your car has been out of the shop after an overnight stay for repairs, it’s even better. I’ve long extolled the wonders of Bucks County, Pennsylvania with all of its wineries and covered bridges, but the towns running parallel to Bucks along the Delaware River on the New Jersey side offer their own rustic charms and often get overlooked. Quaint historic towns running along the Delaware Raritan Canal in Hunterdon County and stretching across gorgeous wooded back roads into Mercer County (home of Princeton University) are more an extension of the small-town meets gentrified rural setting of Bucks County than they are a connecting strip to the New York-influenced North Jersey and Philly-influenced South Jersey megalopilises. On a whim this Saturday I decided to take a friend on a Thief Maker Reality Tour by visiting the famous Philadelphia neighborhood where the majority of my book was set, touring Eastern State Penitentiary and dining at one of my all-time favorite restaurants. From the low-brow satire of Sacha Baron Cohen to the high-brow satire of Irene Nemirovsky…from an obscene film preaching tolerance to a museum depicting the obscene cost of intolerance…it was an interesting, albeit low-key and contemplative visit to New York City this weekend.